From left to right: Airbus Asia EVP Jean-Francois Laval, Airbus Asia Pacific Customer Services VP Bruno Bousquet, Thailand Transport Minister ArkhomTermpittayapaisith and CATC president R. Admiral Piya Atmungkun. Credit: Airbus. 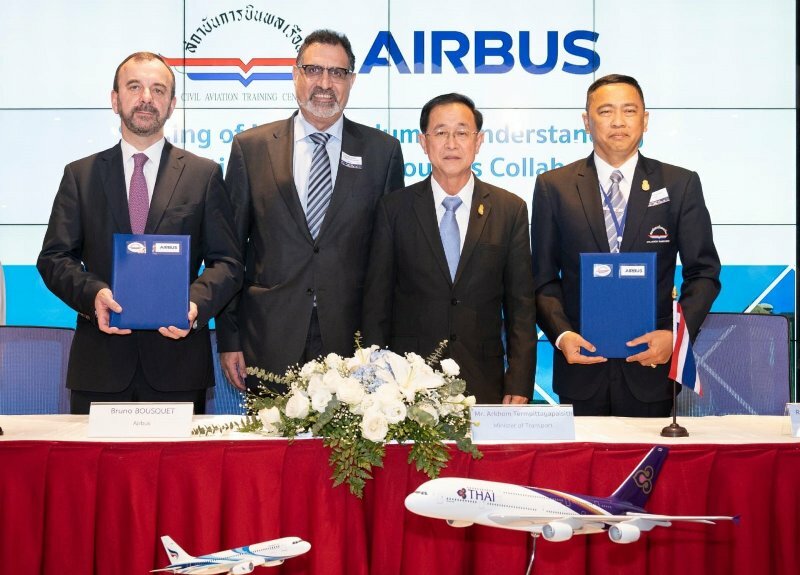 Airbus has signed a memorandum of understanding (MoU) with Thailand’s Civil Aviation Training Center (CATC) to jointly work on projects to develop and undertake maintenance training and pilot training courses. As part of the deal, Airbus and CATC will explore ways to strengthen their cooperation in training aviation professionals in the country. An existing collaboration between the entities on basic maintenance training courses could be expanded to add extra maintenance courses and ‘ab initio’ flight training courses for pilots. The newly formed partnership is expected to guarantee a steady supply of pilots, engineers and mechanics for Thailand’s airlines and maintenance, repair and overhaul (MRO) centres. According to Airbus’ Global Services Forecast 2018, around 220,000 new pilots and more than 260,000 new technicians would be required in the Asia-Pacific over the next 20 years. Airbus Asia executive vice-president Jean-Francois Laval said: “Thailand is an important partner for Airbus, as well as one of the fastest growing aviation markets in the region. Thailand’s flag carrier airline, Thai Airways International (THAI) and its subsidiaries currently operate a number of narrow-body and wide-body aircraft manufactured by Airbus, including the A320 Family, A330, A350 and A380 family. Last June, Airbus and THAI reached an agreement to create an MRO joint venture (JV) at U-Tapao International Airport in Thailand. Once fully operational, the JV will provide heavy maintenance and line services for all wide-body aircraft types, specialised repair shop and other services.